Russia beyond Moscow and sometimes St Petersburg usually remains unknown to outsiders. Yet, recent attacks on the opposition in Yekaterinburg have attracted the attention of some western publications, including The Spectator and Opendemocracy. 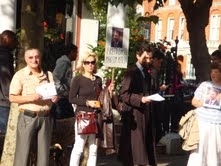 Over the past two weeks a series of pickets have been held outside the Russian embassy in London. The aim of the pickets has been to support Maxim Petlin, a local activist detained in a pre-trial detention centre since 26th August on fabricated charges. For more than a year now Londoners have been demonstrating in front of the Russian Embassy to show their solidarity with the Russian civic movement Strategy-31, whose rallies for freedom of assembly have been brutally suppressed in many Russian cities. Paradoxically, rallies in Yekaterinburg have been allowed to go ahead peacefully. It is only recently that the local Strategy-31 organisers have been directly attacked by the authorities. The next demonstration in support of Maxim Petlin will take place outside the Russian embassy on 30 September 2011 at 3pm.